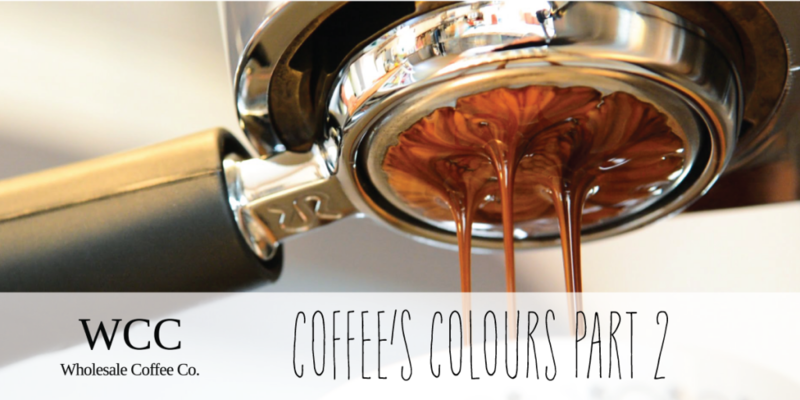 Coffee’s Colours Uncovered Pt. 2 | Wholesale Coffee Co. Following on from our last tip on oils and how they present themselves in the cup this week we are going to cover the basics of sugars. In comparison to Oils, Sugars tend to present through the middle of the shot and are easy to spot as they are a medium brown. Nowhere near as dark as oils and what most people would classify as “coffee coloured”. You’ll usually be able to catch around 30-40ml of sugars from a shot. Sugars are what you will taste in a long black and are responsible for any fruity flavours you may get in your coffee. Darker roasted coffee burns the sugars as part of the roasting process and this is what can give you caramel notes as well. The best thing about sugars is that they actually get sweeter as the drink cools. What you can do to try this for yourself is catch the sugar component of a shot separately, try some immediately then come back to it after a few minutes and the flavours will have changed noticeably. The reason this happens is the complex sugar in coffee begin to break down over time into simple sugars and because you get so many simple sugars from A complex one the overall sweetness of the drink increases. This is also why a long black is always better after it has had a bit of time to sit and cool.